"Don't tell me you got so hard up you slept with a mummy!?" The above info came from Elwin Blaine Coldiron, and was edited by yours truly (contact me). The image came from Kazuhiko Amagasaki. Kazuhiko Amagasaki is Tenchi's pal in school. In the OVA, he only appears in one scene in the first episode. 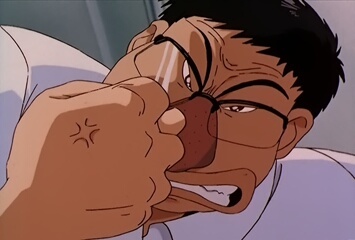 In it, he was the victim of one of Tenchi's few shows of temper. In Tenchi in Tokyo , Amagazaki has a larger (this is not a pun) role as one of Tenchi's pals while he stayed in Tokyo. He was one of the instigators in Tenchi's relation with Sakuya.